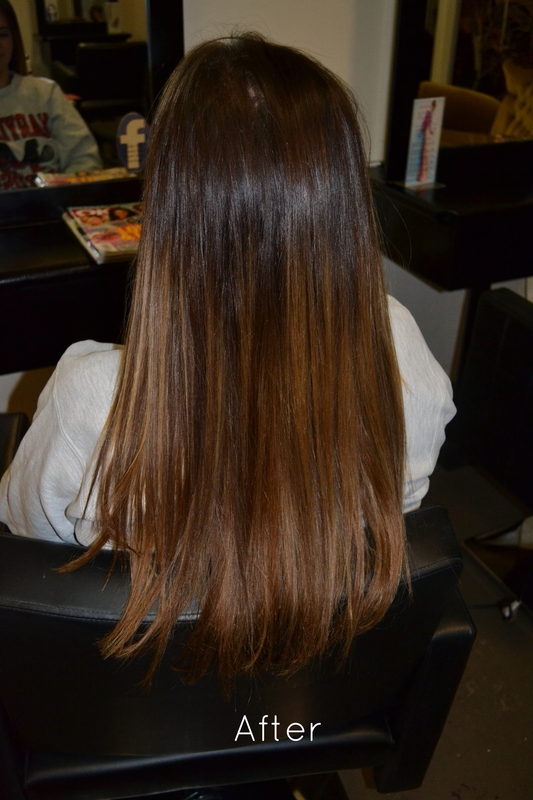 For the best Hair Extensions in Melbourne, we create natural looks to thicken and lengthen hair. 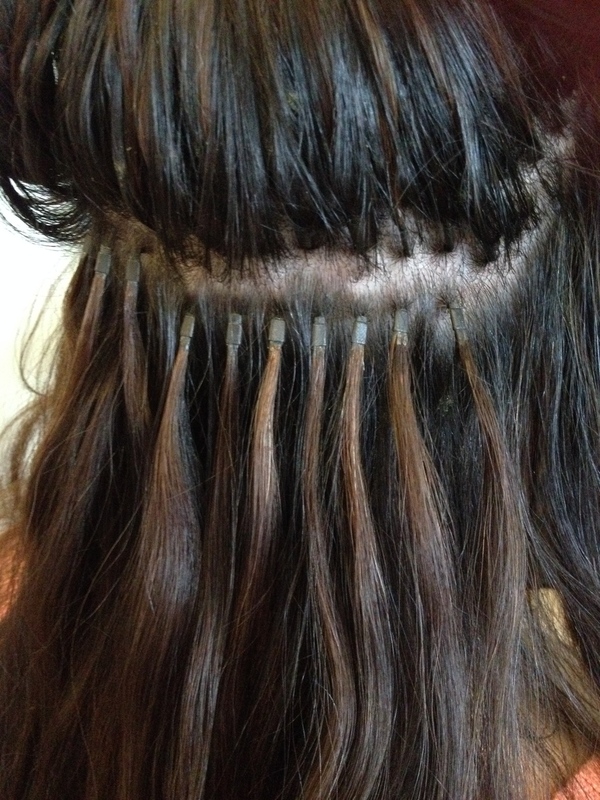 Your hair extensions should be undetectable and easy to look after. They should never tangle or knot. With over 13 years experience doing hair extensions, we are one of the best Hair Extension salons in Mellbourne. You could call us Hair Extension Experts. Our favourites are Amore Hair Extensions and Perfect Hair Extensions which are 100% human remi hair. We do both tape and microbead but also have clip in hair pieces, clip in ponytails and pastel or vivid coloured hair extensions. AMORE MICROBEAD 18" and 20"
1) Shampoo and condition your hair every 3-4 days. The extensions do not receive your natural scalp oils and so need to have moisture added every wash. If you don’t moisturise your hair extensions they will become brittle and break easily leading to split and ratty ends. 2) Always brush out all knots before you wash your hair, swim, or sleep. Start at the bottom and work your way up slowly using a paddle brush. 3) Be sure to brush out the hair and remove all tangles before washing it. This short step is useful in preventing knots that can be locked in when wet. 4) Do not colour your own hair extensions at home. 5) To prevent tangling, run your fingers through the extensions. 6) Avoid washing hair face down. 7) Absorb water with a towel wrap, never dry with a scrubbing action. 8) Bonds shouldn’t stay wet for long periods ie.never sleep with wet hair. 9) Never use any product with sulfates, oil or silicone in it. A definite no no is supermarket shampoos or argan oil based products). 10) Use blow dryer on medium setting, never apply hot curling iron directly to bond. 11) You should have your extensions checked every six weeks or so to ensure they are functioning correctly and to add to or reposition them. 12) Gently tie your hair up while sleeping and never sleep with wet hair. 13) In the summer you will not want to miss out in dips in the pool or ocean because of your new hair. Carefully comb out any tangles that may be present starting from the bottom and working your way up. Once the hair has been detangled braid the hair in two braids to ensure that all of the hair is protected. Following your dip, be sure to wash your hair immediately to remove any damaging chemical. Leasa has been using Amore Hair Extensions and Perfect Hair Tapes on her clients for over 13 years and has tried many other brands and systems but nothing comes close in quality and price. Amore and Perfect Hair ethically source their hair and it is 100% Human Remi Indian Hair. Many brands state that their hair is Human Hair but can be made up of a blend of Human Hair and other things like llamas tail and synthetic hair. Human hair should not tangle even after many washes, it should be easy to comb and never matte. Amore and Perfect Hair extensions can be treated like your own hair. They can be washed, blow dried, curled, ironed and styled just as you do your natural hair. The only things we recommend is to use a salon quality shampoo and conditioner that don't contain silicone and oils, plait the hair when swimming and sleeping and hold the hair at the root when brushing or combing. Leasa can recommend an appropriate shampoo and conditioner and show you easy ways to look after your extensions. We suggest you start off with a 3/4 head of hair extensions for thickness only or a full head of hair extensions for length and thickness. You can always add more later. We can also do 1/4 or 1/2 head to fill in gaps or blend out hair breakage. We will need you to come into the salon for a consultation to colour match your hair before we can order. We then require a 50% deposit to order. It will then take 2-3 days for the hair to arrive in the salon. On the day of your appointment we ask that you come in with clean, dry hair. It then takes about 1 hour to put the hair extensions in. Leasa will then cut and blend the hair extensions into your natural hair. We then recommend you get your Amore microbead and Perfect Hair Tapes lifted every 6-8 weeks. A full head of Amore microbeads takes about 1 hour to move up and Perfect Hair tapes can take up to 2 hours to move up. The hair extension market is flooded with cheap, poor quality hair and there is no official Australian standard on what can be advertised and sold as Human Hair. Many hair extension stylists import in hair extensions from China and overseas with no quality control. There is no such thing as a cheap or discount price on hair extensions. Basically, you get what you pay for. Top quality hair extensions are expensive but should last a year without needing replacing. So how do you choose the right hair extensions and know which are good quality and which are fakes. Firstly, research the brand that the salon or stylist uses. Call the company to see that they are a legitimate supplier. If the salon or stylist are using their own brand, chances are they are substandard and imported in. Ask them if they can guarantee the hair. Amore Hair, Perfect Hair and Birdie Hair Salon guarantees that all their hair extensions are 100% Human Hair and will replace any hair that we believe to be not up to standard. Check the photos on their website. If they have a lot of pictures of celebrities or models with long hair but they are located in the middle of nowhere, chances are the photos are not of their work. Ask them if the photos are of their work or from the hair suppliers website. Legitimate stylists will only post their work or that of the company that supplies them, not work stolen form the internet. Beware when the after photos are of the hair having been curled. This is a visual trick to make the hair extensions look more natural. 100% human hair extensions should look natural straight and photos should be published in the hair's natural state. The hair extensions should look soft and silky when they are taken out of their packet and should never be too shiny or smell like plastic. If they are too shiny or smell, this is a sure fire sign that the hair is covered in a plastic coating, which is used to cover up the fact that the hair extensions are low quality or a synthetic blend. Hair extensions should never hurt or be uncomfortable. They should not pull out your own hair or shed hair themselves. The hair should not matte or tangle and if they do, the stylist should be contacted straight away. If you have any of issues or doubts about the hair you have purchased, contact the stylist or company immediately. They should resolve the issue straight away and offer a resolution. Do you have a question or query about hair extensions? Where did you hear about Amore Hair Extensions at Birdie Hair and Beauty? All of our prices are effective as of 1st May 2017 and are subject to change without notice. You will be required to come into the salon for a consultation so your hair can be colour matched. We then require a 50% deposit before we order the hair extensions. The hair will take 2 business days to arrive at the salon so please be aware of this when planning. A cancellation fee may be charged for appointments cancelled with less than 24 hours notice. We do not offer refunds on our hair extensions but special circumstances will be considered by Management and must be accompanied by proof of reason for refund and must be lodged within the first 3 months after application. We fully consult each client and offer advice where needed. It is your choice whether you take this advice. If you change your mind about the hair extensions after your appointment, there will be a charge to have the service done again. We always consider the condition of our clients hair with the upmost importance. We cannot be held accountable for damaged hair extensions or lack of holding due to you using cheap hair products, heating tools without protector spray, Supermarket or home dye, other salon's prior hair services or just general mistreatment of your hair. We do not recommend hair extensions on clients with previous diagnosis of Alopecia unless accompanied by a letter from their doctor. Please call us within 2 weeks if there is an issue with your service. After that time, we cannot guarantee our work. We love pictures and they can say more than words but please be aware that we cannot make you look like the model/actress/celebrity that you desire. That will take a surgeon's knife. We will do our best to recreate the look but do remember that the person in the photo is heavily made up, is Photoshoped and probably wearing more hair extensions than the average person can afford.